Kate the Great is a legendary American craft beer in my book. It was a big, robust stout, released annually by Portsmouth Brewery. The only access I had to the beer was via trades. Matt, a great trading for years, was kind enough to send me back-to-back years of the beer. I had cellared them until recently. I am glad I waited as it was great to get reacquainted with such a fine lady. The first, a Tuesday night beer club bottle share in February 2010. 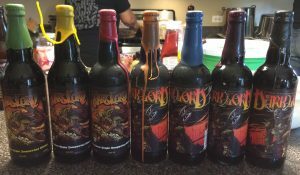 The second, a Thursday night beer club get together in the last few months when I attempted to do a mini vertical of the last two years the beer was released. That first time was magical and I set out to get at least a bottle of my own. Eventually I stored up three bottles; one of those is still in the cellar. Maybe a treat if the Cubs win the World Series. After having the beer the last time, I decided there was only one way to potentially taste the beer again: home brewing. 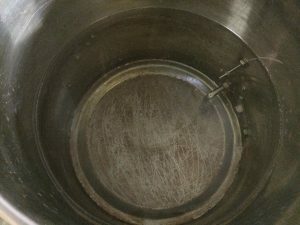 Per typical, I turned to homebrewtalk.com for a clone recipe. Something this good had to have been sought out by the large home brewing community. The huge thread still lingers on today with tons of great feedback. I decided to take the percentages in the first post as the gospel, creating a recipe to those specifications. The amount of dark malt, almost 3 pounds, is an absurd amount in home brewing career. Once again, just as I have been and, most recently with Baller IPA, my grain mill was pretty much useless. I had to dump grain at least 10 times to reset the mill as the non-driven roller continues to have a mind of it’s own, moving any which way it desires in spite of being locked down. Many of those times it bound up against the grain hopper, stopping the milling process completely. Frustrating, almost to the point of infuriating. My nine year old’s help was the only thing keeping me from blowing my stack. My efficiency suffered immensely, possibly the lowest percentage wise ever. The gravity ended up some 20+ points lower than my brewing software predicted. Outside of the milling process, the brew day went well. I am really taking to the Friday after work brew day. It leaves the rest of the weekend open for family time. Enjoy! Note: I have reached out the the manufacturer of the mill. He has been very helpful in explaining what I should be able to do to stop my issues. More on this next brew day. 2016-10-22: slowly fermenting at 65.8*F.
2016-10-23: morning – medium fermentation @68.1*F.
2016-10-23: afternoon – hard fermentation @72.1*F.
2016-10-24: morning – hard fermentation @72.6*F.
2016-10-24: evening – medium fermentation @67.7*F. Added heat blanket set to 70.0*F.
2016-10-26: reduced heat blanket temperature to 68.0*F.
Useless Fact: Ants can accidentally misinterpret the chemical trails left by other ants and start walking in circles. If too many members of the colony join in, it can kill the whole colony in what is sometimes known as the “Death Spiral”. 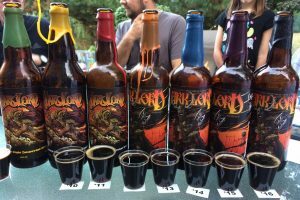 I continue to stand by my claim that my sense of taste and aroma evolve as more potent version of India Pale Ales (IPAs) hit the craft beer market. This causes my perception of beers gone by to no longer have the same quality of impact. My home brewing is affected by these changed perceptions: I need to increase the hop profile, keeping my senses appetite satiated. Smiles IPA was my second attempt at a Northeastern style IPA. I used a bit more varied malt profile and multiple type of hops as compared to Used. The hope was to push the hops to 11, allowing my lack of location to the Norther east, to not inhibit my ability to enjoy juicy, ripe IPAs. Look: Pours cloudy with a half finger of white, loosely packed bubbled foam. Retention is meager for an IPA. Mildly effervescent. Aroma: Big, juicy tropical hops abound. Taste: Taste isn’t as big as the aroma. Tropical fruit is there, less instense. A little of the base malt comes through. Citrus. A little on the thin side, only carried by the carbonation. Not oily in spite of the amount of oats. Dry finish. The aroma outshines the taste and, be far, is the best part of this beer. If I was to brew again, I would add more late kettle hops and probably some type of speciality grain to give it more malt character. Too neutral for me. 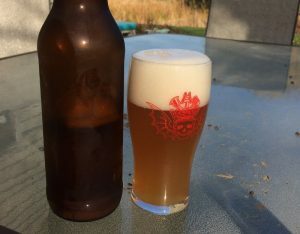 A better attempt at a Northeastern style IPA than Used. Getting closer but still missing something. 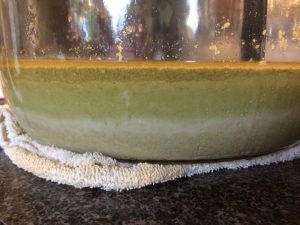 Yeast? Hop process? Water profile? Enjoy! You are currently browsing the Sips blog archives for October, 2016.